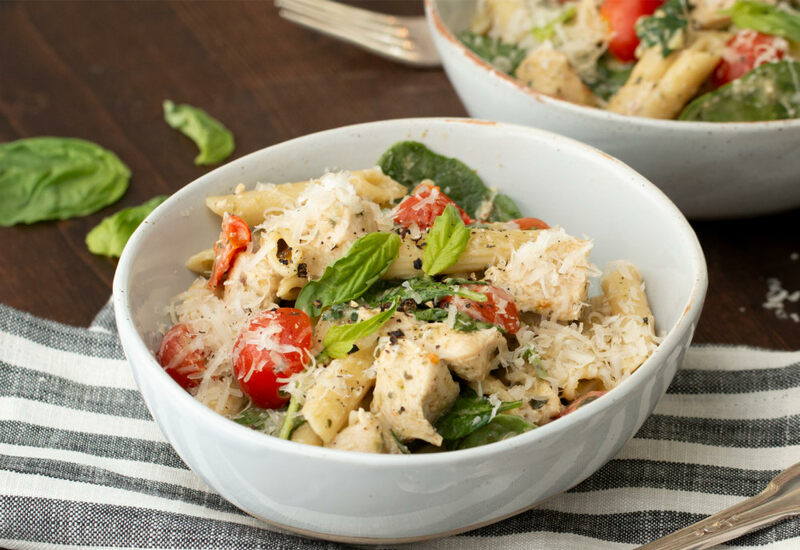 You can achieve a deliciously creamy pasta dish in one pot and in less than 30 minutes with your pressure cooker and this recipe. Cook the chicken and penne together in the cooker and mix with a homemade sauce using pesto, cream cheese, and fresh seasonings. Fresh cherry tomatoes pair perfectly with the basil pesto. Finish with grated Parmesan cheese and basil for a fantastic finish. There is hardly anything as rewarding as perfecting your homemade pasta sauces, and few are as simple as pesto. Use the link in the recipe for homemade pesto sauce or your favorite pesto recipe to make large batches. You can freeze in ice cube trays to assure you can enjoy the flavors of summer all year round. Here's a look at more Pressure Cooker Recipes. Per Serving: 730 calories; 30g fat; 45.9g carbohydrates; 69g protein; 171mg cholesterol; 2032mg sodium. Who would have thought that cream cheese and pesto are so yummy together?! It was really delicious. I left out the tomatoes, but other than that I followed the recipe exactly. The noodles cooked perfectly, not soggy and not stiff. My kids are glad I gave them something other than traditional meatball spaghetti. I wasn't sure how this pasta would turn out but it was so creamy and delicious. It only took 5 minutes to cook in my pressure cooker, and I only had to use a single pot. Winning! I used store bought pesto, reduced fat cream cheese, plus all the seasonings listed in the recipe. This was absolutely perfect. This was my second time making pasta in my pressure cooker and the first time was a complete fail. This method of cooking the pasta first, then stirring in the sauce works much better. I used store-bought basil pesto and it was really delicious. Going to make this again with rotini noodles and no meat. Yum! 30 minutes well spent making this convenient pressure cooker recipe! The sauté function is my favorite. I've made this twice already, that's how good it was. I'll admit, I used store bought pesto out of a jar, but it was still really good. I also really enjoyed the cherry tomatoes and all the toppings too. Great for weeknights and super quick. My whole family loved this dish. Fed 6-8! The entire family loved it. Would be tasty even without the chicken. Will be making this again. So. Incredible. This was my first Mealthy MultiPot meal and WOW—so delicious and one of the easiest meals I’ve ever made. Substitutes/Alterations: - No tomatoes - Spring mix instead of spinach - Pre-made pesto I only wish I’d ordered my MultiPot sooner! So yummy! Super fast. Only 2 minutes under pressure to get the chicken and pasta cooked to perfection. Wow! Have all your add-in items prepped, because if you’re having to scramble, you’ll lose moisture, overcook, and end up with a not quite so creamy finished product. Used homemade pesto, with basil I grew, plus cherry tomatoes and fresh basil from my own garden. Great flavor. Will definitely make this meal again! This was the first recipe I tried in my new Multi Pot, and it came out very good! Delicious. Filling. Made enough to feed 4 of us plus leftovers. This was my first dinner in the Mealthy and we loved it!! So easy and so good!! This was also my first Mealthy recipe (even though my wife bought our MultiPot for herself, I’m the one that got to break it in.) I had all of the ingredients handy, except the penne, so I used farfalle as a substitute. No issues. Everything worked out fine. One word: amazing! Another word: easy! Not so sure how clean-up is going to be, however. This being our first recipe, we were surprised by the white, chicken broth water spewing out of the release valve. It got everywhere. Nevertheless, this recipe has solidified my confidence in the product like fresh fruit margaritas solidified my love of the Vitamix. Not a bad recipe I made this for the first time in my new Insta pot not really crazy about boiled chicken so I think I would sauté and add in at the end. This is the first meal I made with my Mealthy Pot and everyone loved it! I agree that you have to have all of your ingredients ready once the pasta and chicken have cooked. I wasn't quite prepared and mine dried out a little bit but it was still delicious. For us, the next time I make this I will add more spinach and more tomatoes, maybe even some mushrooms. I also love the fact that everything was done in one pot. I'm a huge fan of "one pot meals". Can't wait to try another recipe. Quick, easy and delicious. This was my first pressure cooker meal and I’ll make this again. I think next time I’ll cook the chicken breast whole rather than cutting into chunks and shred it after cooking. It came out a bit dry, but the rest of the recipe was great! This was excellent! We substituted sundried tomatoes for the cherry tomatoes because of picky kids. They loved it, and one even went back for seconds. Great, quick recipe! Two minutes cooking made for the most tender chicken and perfectly done pasta. Very easy and delicious, but I had the same problem already mentioned...frothy pasta/chicken broth coming out with the quick release steam. Any tips on dealing with this? It got all over the pot and countertop. One of my favorite recipes to date. Such a yummy and quick pasta recipe that's wowed myself, my boyfriend, and my friends. Have already made it twice and will be making it many more times for sure! Turned out fabulous!! I used store bought pesto, added peas and substituted the penne with bow tie pasta. Super easy and super fast!! I LOVE my MULTIPOT. Have made a couple of things, and just made the best hard boiled eggs EVER! I'll never put a pot of water on the stove again to boil eggs. Also see an awesome chicken recipe that I'm going to use the leftovers from a previous chicken dish and modify to this recipe! Can't wait. This was very fast, easy and delicious.